Review: Lyra Belacqua, a young girl sets off on a journey to go and find her best friend. Enjoyed it much more than I thought I would. The little girl that played Lyra was excellent. A lot of CGI done in this film. Kids and Family will love it. 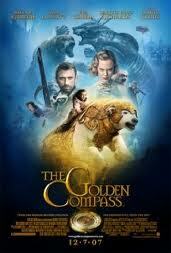 Based on the book by Philip Pullman. I cannot compare this film to the book as I have not actually read the book. Great cast. Philip Pullman originally wanted Jason Isaacs to play Lord Asriel. In 2008 the film won an Oscar for Best Achievement in Visual Effects. The same year it also won a Bafta for Best Special Visual Effects.